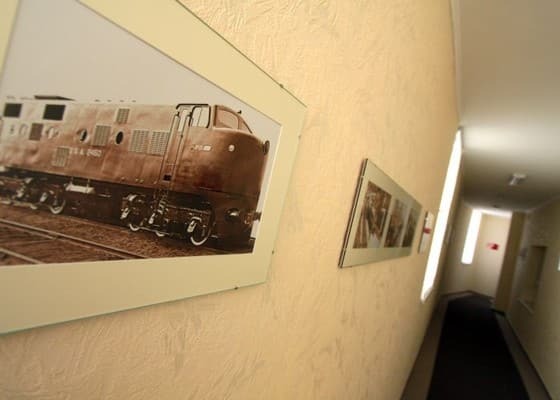 The hotel Reikartz Dvorgec opened its doors to the first guests in December 2009. 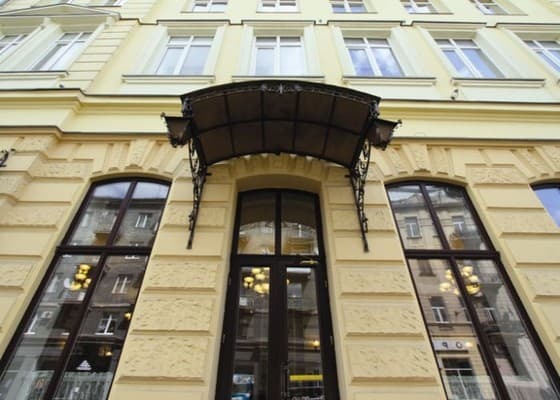 Reikartz Dworzec Lviv Hotel is situated in the historic center of Lviv, on one of the longest and oldest streets – Gorodotskaya. Close to the hotel there are such important sites as the main Greek Catholic church in Ukraine – St. George"s Cathedral and the beautiful Church of St. Elisabeth. 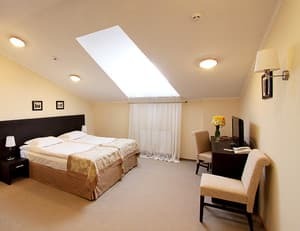 Description of the room: The room includes: 1 or 2 single beds or 1 double bed,a mini-bar,a safe,a hairdryer,a plasma TV-set,a satellite TV, the Internet access, a telephone, a worktable,a wardrobe, a bathroom with a shower cubicle. 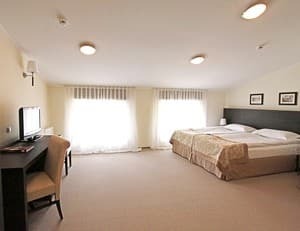 Description of the room: The room includes: 1 double bed,a mini-bar,a safe,a hairdryer,a plasma TV-set,a satellite TV, the Internet access, a telephone, a worktable,a wardrobe, a bathroom with a shower cubicle. 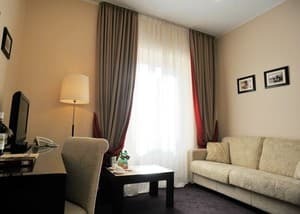 Description of the room: One room with 2 single beds (900 * 2000) or 1 double bed (1600 * 2000), a sofa bed. Room rate for 1 person. - 1500 UAH. Чистый, уютный отель. Тихий дворик. Доброжелательный и улыбчивый персонал. Близкое и удобное расположение отеля между ж/д вокзалом и историческим центром. Номер крошечный, но для одного человека вполне подходящий. Отсутствие в номере тапочек и шампуня. Пришлось покупать специально. Персонал помогал во всем. На территории отеля всего пару парковочных мест, но рядом в 500 метрах есть большая парковка за символическую цену. Завтраки стандартные, как во всех гостиницах. Единственное что понравилось, это кухня. В номере стоял запах канализации, который при открытом окне не выветрился в течении дня. Нет мыла и прочих банных принадлежностей. Розміщення близько до центру і до залізничного вокзалу, привітний персонал, абсолютна чистота, затишні номери. Під час заїзду персонал не був проінформований про дитину віком 5 років, яка мала проживати разом із матір*ю в одномісному номері. новая, чистая, уютная, тихая гостиница европейского уровня. стильные, красивые номера. Children under 6 years stay in the room with parents. 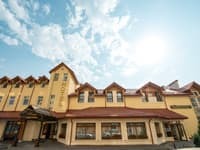 All older children or adults are charged UAh 115.00 per night and person for extra beds and its included a breakfast and dinner. There is a Polish restaurant and a lobby bar. 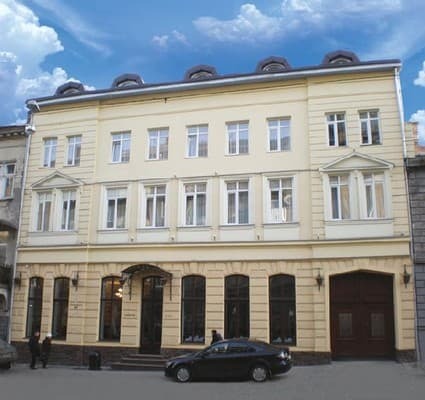 Reikartz Dworzec Lviv Hotel is situated in the historic center of Lviv, on one of the longest and oldest streets – Gorodotskaya. Close to the hotel there are such important sites as the main Greek Catholic church in Ukraine – St. George"s Cathedral and the beautiful Church of St. Elisabeth. From the airport: Option 1. Take a trolley bus No9 to the station “Vulitca Stepana Banderi”, and then take a short walk according to the plan below. Option 2. 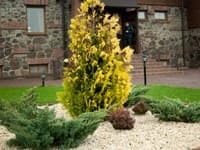 You can place an order for a transportation service with the hotel. The price for this service amounts to 200 UAH. From the railway station: Option 1. Take a tram No6 to the station «Ploschad Kropevnitskogo». Option 2. It will take you about 15 minutes to get to the hotel by foot. Option 3. 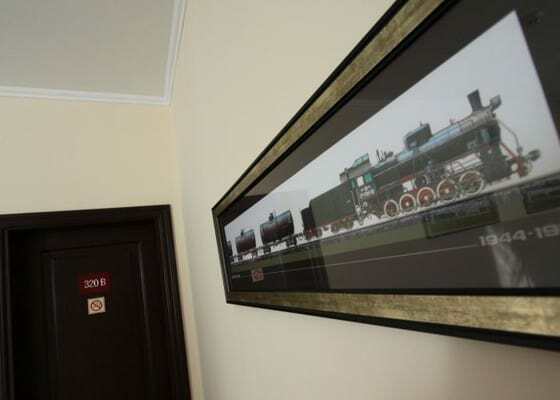 You can place an order for a transportation service with the hotel. The price for this service amounts to 100 UAH. From the central bus station: Option 1. Take a bus No37 to the station « Ploschad Kropevnitskogo», and then take a short walk according to the plan below. Option 2. You can place an order for a transportation service with the hotel. The price for this service amounts to 100 UAH.